Solo Urban Universal Fit Tablet/eReader Booklet. Universal fit technology adjusts to accommodate tablets or eReaders from 5.5 to 8.5 inches. Unique rear design offers enhanced leverage when viewing at multiple angles. 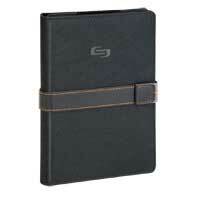 Magnetic strap ensures the booklet stays closed and tucks away to not obstruct screen view when in use. UNIVERSAL FIT technology adjusts to accommodate tablets or eReaders from 5.5 to 8.5 inches (14 cm to 21,6 cm). Unique rear design offers enhanced leverage when viewing at multiple angles. Magnetic strap ensures the booklet stays closed and tucks away to not obstruct screen view when in use. 6" x 8.2" x 0.79"